BTS Rap Monster covered Drake's "Something"! Rap Monster added his own lyrics and mixed the track himself and the result was an ear candy explosion. His soothing voice also makes a perfect lullaby for fan girls. Listen to his cover below! Do you love it? My nicknames - RapMon, God of Destruction. Strangely, everything I touch breaks. The legs of my sunglasses snap off, or the refrigerator handle falls off. Because of that, I got the nickname God of Destruction. My image before debuting - A neat and quiet student. Adjusting to idol life - The one and only thing that makes me think “I’m really a singer now" is when I perform at music shows. My ideal type - A feminine girl with pale skin. An episode while you were a trainee - Dancing is not my thing. There were multiple times when I thought about running away while taking dance classes. These days the members call me “Dance Prodigy" Of course, they mean it in an ironic way. One day I will also - Will there be a day when Bangtan tops the charts? How to enjoy hip-hop - Don’t think of it as something difficult. The genre that anyone can dance along to and enjoy - that’s hip-hop. Bang Sihyuk PD is? - To the public, he’s somebody who makes stinging remarks, but when he listens to music with a good beat and praises it, he shows his boyish side. An episode after debuting - During a music show, my in-ear piece fell out so I missed a few bars of the intro. I got scolded severely but because of this incident, I’ve gotten into the habit of meticulously preparing and checking myself. To the members - Let’s meet sometimes for a long time. It’s the title of a song by Dynamic Duo sunbaenims, but if you think about it, it actually has a good meaning behind it. Just because I remembered it. My nicknames - Pink Princess. When Bangtan’s profiles were first released, fans gave me this nickname after learning that I like the color pink and cooking. My image before debuting -The cute maknae who always listened to his parents. My charms - My full bottom lip. The back of my head is round. Attractive points - As a trainee, I practiced taking photos. While practicing, I learned that my right jawline is attractive. Members’ secrets - On a very tiring day, roommate Jimin fell off from his bed with a loud thudding sound. Both Jimin and I were very embarrassed. Things I want to steal from other members - Jimin’s abs. When someone tells me I’m handsome - I’m always happy to hear that. These days, I also like hearing that I’m cute. Something that made me happy recently - I’m usually a really hard-working person. It’s chaos when all seven members wake up at the same time so I feel more comfortable waking up earlier than the others to start getting ready. A while ago, I woke up two hours earlier (as usual) and ate a bowl of cereal for breakfast and felt very happy. The quietness and relaxing feeling. The best part about debuting - This is the first time I’ve received so many letters. Apart from letters from my family. I’m so thankful that fans send me so many letters. I re-read all of them and talk to myself. Saying thank you. My nicknames - Hope, Smile Hoya. I got these nicknames because my name is J-Hope. My image before debuting - A passionate child who liked dancing. When I was younger - I was quite famous in the Gwangju underground. Rapping, dancing, and singing was my life. To me, Bangtan is? - Another me. A song to listen to on rainy days - Remy Shand’s “Rocksteady"
When I feel strained - I look at the sky. These days I’m happy so it goes away naturally. Things I want to steal from other members - Jimin’s chocolate abs since mine have started to slip away because of our busy schedules. Also, RapMon hyung’s rap skills, and his good English?! Members’ secrets - We all have abs. It’s just that mine have melted a bit. One day, I too will - [Be like] Beenzino sunbaenim and A$AP Rocky. They influence my music and fashion style. If we ever get to do variety shows - V is the best for it. He has 4D charm. If he just controls it well, I think he’d make everyone laugh. I’m looking forward to it. My nicknames - Blank Tae, TaeTae, Vee. My real name is Kim Taehyung. I’m Blank Tae because I make blank expressions sometimes, TaeTae because it’s derived from my real name, Vee because some people have trouble pronouncing my stage name. My image before debuting - A normal, energetic and humorous student. When I was younger - I played the saxophone since 7th grade. After receiving advice from my dad, I decided to become a singer. My charms - My eyes may seem blank most of the time, but they can also give off a unique feeling. The number one cook - Suga. Knows how to make really good kimchi fried rice. I prefer sampling than cooking. Ah! There’s another episode related to cooking - the seaweed soup Jin hyung made for J-Hope hyung’s birthday. At the dorm, the members - Spilling food is something that happens frequently at our dorm, and at times like this, the one who cleans up the mess is J-Hope. He cleans up after us neatly, just like a mom. He’s also good at folding the laundry like a mom. My role is the son. I’m in charge of the washing machine. We take care of our dirty dishes individually, Jimin is in charge of the kitchen, and RapMon hyung sweeps the floors. 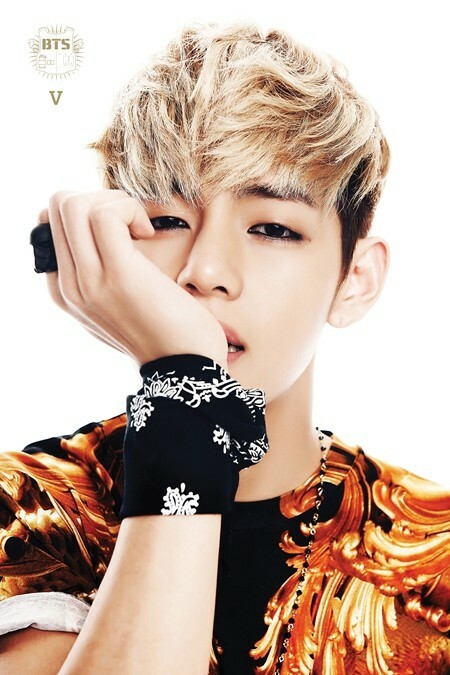 Mood-maker - Of course it’s V. The members might think differently. I think they might choose Suga hyung. I’m the best in these kind of moments - When I’m on stage. I noticed this while monitoring myself but I look cooler than I expected during closeups. Of course it’s something achieved thanks to the hard work of the staff, but I’m satisfied. 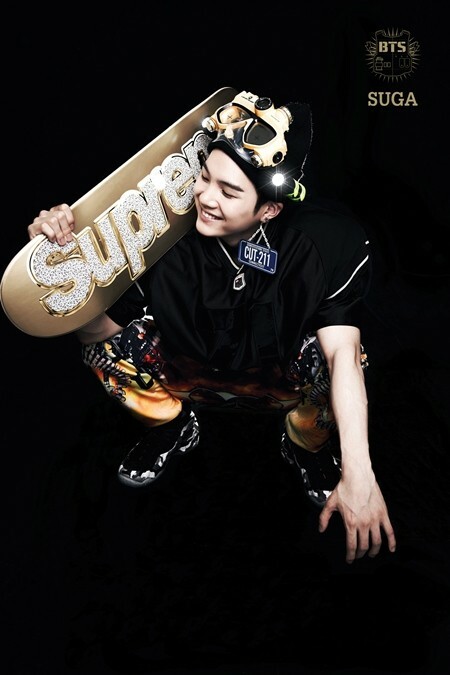 My nicknames - Suga. My real name is Min Yoongi but now that’s my nickname and name. My image before debuting - I started music in 6th grade. In middle school I learned classical composition and started writing songs daily after that. Am I a sweet guy? - Hm. I’m closer to straightforward Gyeongsangdo guy than sweet. But in front of fans, I’m a sweet guy. My charms - Eye smile? How I deal with stress - Write lyrics like crazy. It’s something I always do but I’m used to relieving stress through music. Music I listen to when I’m angry - Rick Ross’s “Hold Me Back"
Music holds this kind of meaning for me - All-in. If you take away music from my life, there would be nothing left. Things I want to steal from other members - The thing you can’t buy with money; maknae Jungkook’s age. If I go back to being 17 years old like maknae Jungkook, I want to - Study. I want to be a good son who doesn’t rebel against what his parents tell him. To hip-hop newbies - It’s definitely not a difficult genre. It’s a popular type of music. Hip-hop is something that allows you to feel the sincerity of the artist. At the dorm, the members - When we don’t have schedules, under the command of our manager hyung, we monitor ourselves thoroughly and practice whenever we can. We live to practice! Something that made me happy recently - Our first fansign. Also today because it’s our first photoshoot. My nicknames - Jeon Jungkookie, Golden Maknae, Kookie. Role as the maknae - Benefit of being able to act childish. My image before debuting - A normal student who liked playing games and liked hip-hop. When I was younger - I was a child with a lot of interest in the arts. Currently, I am - A curious 17 year old. Games, cars, makeup, drawing. I normally didn’t use it but now when I receive makeup I come up with lots of questions. When you use this tool, how you use it. To me, Bangtan is? 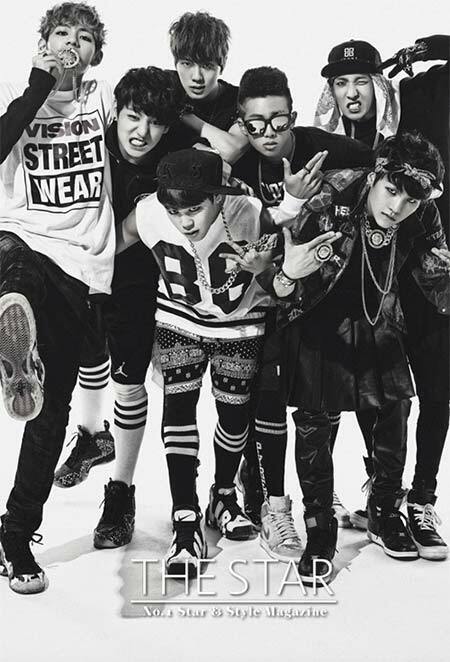 - Bangtan is my life~! Something I really want to accomplish - Composing. I’m studying it really hard. Although I’m only lightly reviewing a basic music program, I want to be a musician who writes brilliant lyrics like my hyungs. My favorite times of the day - Resting time, free time, eating time. I just noticed that they’re all times when I can play. (laughs) Practicing and performing on stage is also fun. Things I want to steal from other members - Rap Monster hyung’s knowledge, Suga hyung’s diverse knowledge, J-Hope hyung’s positive mind, Jimin hyung’s persistence and effort, V hyung’s natural talent, Jin hyung’s wide shoulders. Something I’m addicted to these days - Only music. I have my earphones on all day and listen to music. I think I’ll be like this forever. My nicknames - Ddochi. Since middle school, my friends said I looked like a puppy so they called me that. Role in the team - In charge of abs. These days I don’t have time to exercise so they’re sliding off a bit. I need to restore them to their original state. My image before debuting - I wanted to be a singer since middle school. I planned my future and told my parents about it and they happily approved. My ideal type - A cute and charming girl. To me, Bangtan is - Another family that allowed me to reach my longtime dream. My charms - My abs aren’t actually my charm, my eyes are. Someone I think is “cool" - I like Big Bang’s Taeyang sunbaenim and Shinhwa’s Minwoo sunbaenim and Chris Brown. Things I want to steal from other members - RapMon hyung’s height, V’s talent and gaze, J-Hope hyung’s cleanliness, Suga hyung’s diverse knowledge. I’m sexiest when - When I find the right camera while on stage and stare into it intensely. You usually can’t find sexiness in me. 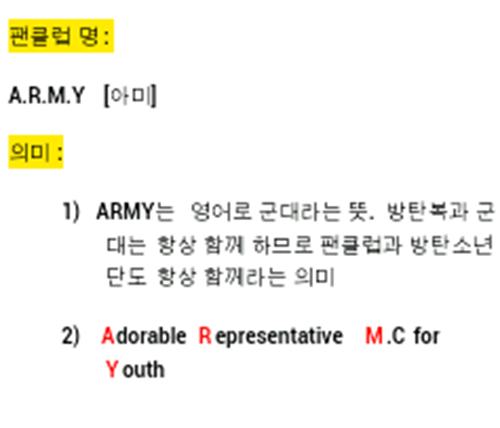 To fans - Please love Bangtan lots, and watch over Jiminnie a lot! 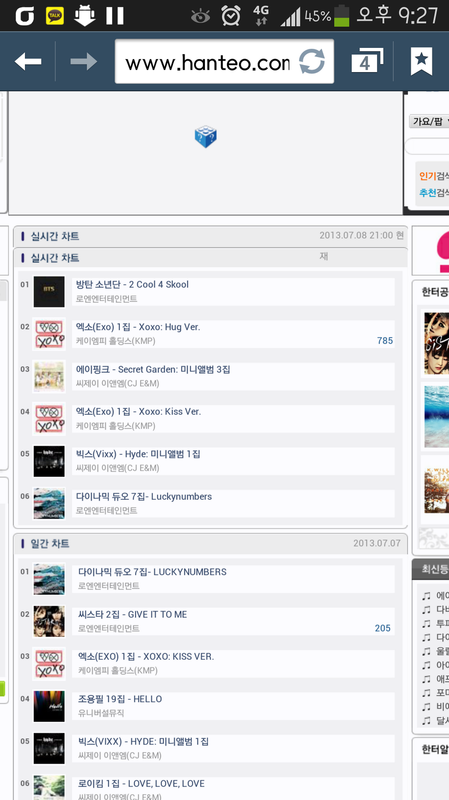 BTS #1 of Hanteo’s realtime chart!! [NEWS] 130703 BTS RELEASES MV-LIKE SHOWCASE SKETCH FOR THE SONG “LIKE"
BTS left fans unable to pick a bias with their latest behind-the-scenes footage from their showcase! The video contains scenes from their debut showcase pieced together for a total fanservice worthy clip that goes with their song “Like". For fans who weren’t able to see the showcase, the video should serve as a special treat, so take a look! How are you liking this group so far? 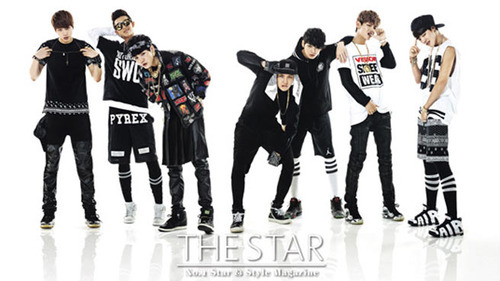 On July 2, Big Hit Entertainment revealed that the spread for The Star was taken when BTS was only six days old since debut. Despite still being babies in the industry, the BTS members appeared as if they were made for the camera in the photos revealed. During the interviews, the BTS members talked about their anticipation to make their debut stage, which was later met positive response. Unlike their title song, No More Dream„ the BTS members seemed to have many dreams, one of which was to become the best rap stars in Korea in ten years. The full spread and interview will be included in the July issue. [INTERVIEW] 130628 - BTS “NEGLECTFUL TRAINING PERIOD, RESENTED BANG SIHYUK BUT…"
BTS, made up of 7 members, Rap Monster, SUGA, Jin, J-Hope, Jimin, V, Jungkook, have drawn eyes with ‘Bang Sihyuk label Hip Hop idol’ modifier since before debut. 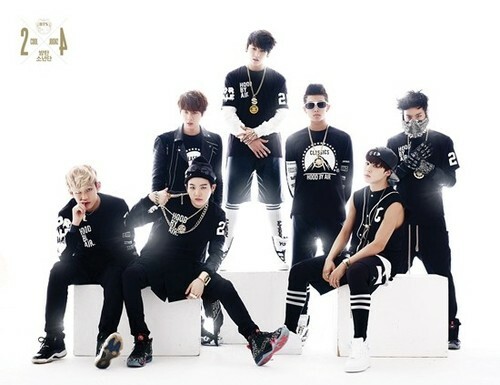 BTS has spent 1-3 years in training after being formed as part of Producer Bang Sihyuk’s project. During their delay in debut, they provoked a related search words ’when’s debut. I’m pissed’ along with other incidents that one can hardly laugh about. "Now it’s a memory", they say, laughing casually at the title ’rookies who aren’t rookies’, the mature group of boys BTS shared the difficult times they’ve had pre-debut with <SportsSeoulDotCom> on the morning of the 25th. -Being labeled as ‘Bang Sihyuk’s Idols’. Isn’t it a lot of pressure? "Honestly, it was a lot of pressure. We’ve gone through a lot of preparation during our time as trainess, but our shoulders felt heavy from thinking we must become idols who won’t let him down, especially because he is such an outstanding figure who deserves a lot of respect. 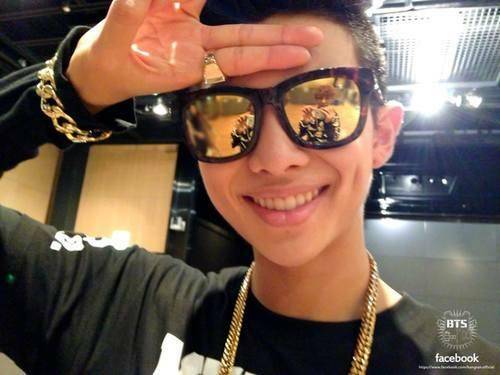 (Rap Monster)." He has a popular image of a ‘malicious person’, but he has always been tender to us. There are lots of things I want to take up after him. He even gave me my name(V)." "They usually assume that he named us ‘Bulletproof Boy Scouts’ becausee we were raised by him, but that’s a misconception. It has a hidden profound meaning of reflecting life’s bullets and resisting them (laughs). Does it sound too high-flown(SUGA)?" -Tell us about trainee days. "There were many times during training that I’ve wanted to give up. Idols who’ve debuted with great difficulty may empathize; it was very difficult. While training with J-Hope, I thought we were neglected trainees because there weren’t any new members being recruited and added(laughs). There were times I wanted to cry from the monotonous routine in a dorm, away from parents. But recalling it now, it’s become a fond memory(Rap Monster)"
"My friends and family asked when in the world I’m going to debut….Whenever they did, I grew scared. I really wonderd if BTS was really training to never exist. But there was nowhere I could get a confirmation from, so it was frustrating. It felt like all my friends who practiced with me were debuting(J-Hope)." "I resented Bang Sihyuk PD (laughs). He’s someone I respect, but at that time I despised him. So one time, I left in the middle of practice and went to find Bang Sihyuk PD to tell him I’m quitting. I saw it like a bold declaration, but after a great bout of scolding, I ended up reluctantly walking back to the practice room to practice (laughs). Back then my mind was narrow because all I ever did was practice, but now that I look back to it, I think Bang Sihyuk PD had given us just the right amount of time. We got to make all the music we wanted during that period. 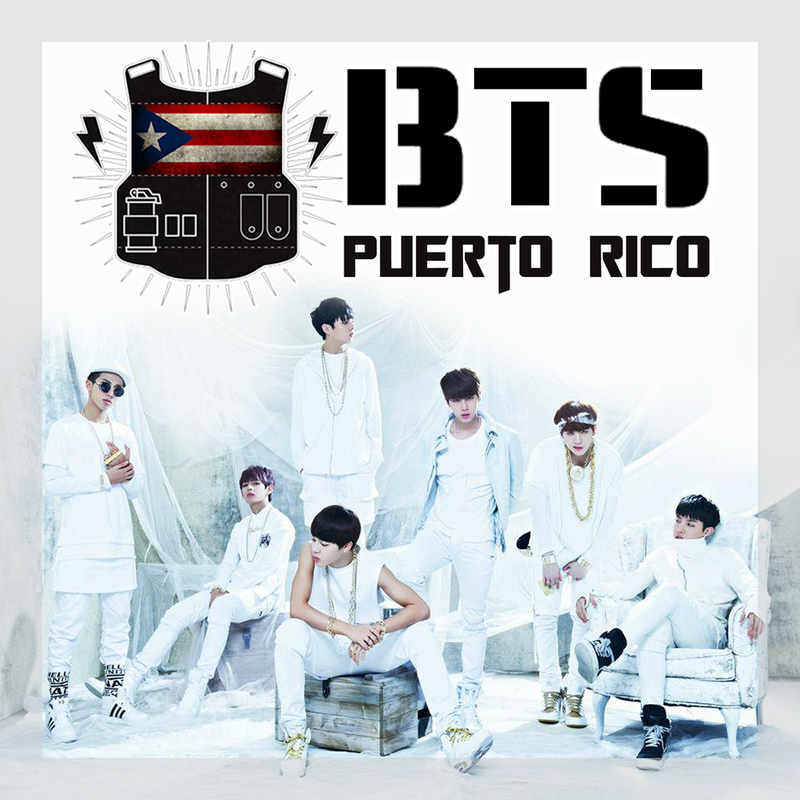 I could say, because of this, BTS could exist(SUGA)."